Betrayal is one of Pinter's better plays. We might expect the 1978 concept now to look tame, that of telling the narrative of an affair in reverse order from the close two years after the affair has ended, to a final scene showing the first rush of lust. However, it is Pinter's precise use of language which raises this play above the ordinary. When three outstanding actors take on the roles of the three major characters, the resulting production is not just a great evening, it's a must-see. There has been much written already on these pages about the story of these three deceivers. Jerry (Toby Stephens) the literary agent, married to the hospital doctor, with whom he has two children, Judith, who we never meet. 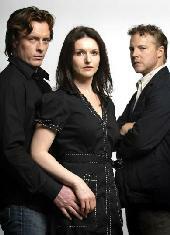 Jerry's lover is Emma (Dervla Kirwin) who is married to Robert (Sam West), a publisher and again they have two children. After her affair with Jerry, Emma takes up with another mutual acquaintance, Casey, whose agent is Jerry and whose publisher is Robert. Pretty incestuous stuff! Again Casey, like Judith, is talked about by everyone but never seen. Betrayal portrays these middle class intellectuals as liars and hypocrites, chancers who put their own sexual desires and thrills above their families. I found myself gasping when Robert talks about having to hit his wife occasionally, but Betrayal is one of Pinter's less openly violent plays. The violence is all in the destructive pattern of deceit, the way they lie to each other to preserve their selfish affairs. Betrayal was written at the end of Harold Pinter's marriage to the lovely actress Vivien Merchant. He had an affair for years with a television media personality until he met his present wife, Antonia Fraser, who was then married. So many of Pinter's plays are drawn from his own experiences, closely observed conversations, that it is interesting to guess which character he saw himself as. Not Robert the husband who retaliates with numerous affairs of his own surely, but the lover Jerry, charming, unreliable, shallow. Toby Stephens is wonderful as Jerry. The delicacy of the reactions of the opening scene when they meet after an interval of two years are finely judged. Dervla Kirwan too manages to look troubled only to break into a smile when he appears. Their dialogue repeats nervously with "How's it going?" the small talk of people who have so much more to say but don't know how to say it. Jerry is such an egoist, not as clever as Robert which Robert enjoys pointing out. He runs his fingers through his magnificent amber hair and is very handsome. Kirwan's Emma seems happiest with her Italian tablecloth attempt at homemaking in the Kilburn flat she and Jerry have rented for their affair. Sam West as Robert gives a very tight and calculating almost stuff shirt performance. The betrayal that really hurts him seems not to be that of his wife, but that of Jerry, his best friend and best man at his wedding. The scene where Robert tells Jerry how he feels in the restaurant is caustic. Sam West is interestingly starting to sound a little like his father Timothy West as he comes of age as an actor. Sadly I never saw Toby Stephens' father Robert on stage so I can't tell you if the son resembles his thespian father. The play closes with the start of the affair when, at a party, Jerry pursues Emma with lavish declarations as to her beauty and how he can't live without her. Why do women believe these courtship rituals or expect them to endure? They are just another lie. I liked the scenes between the two men where they discuss laddish stuff and Robert obviously wants to thrash Jerry at squash. Often Robert has Jerry at a disadvantage because he knows about the affair but Jerry is unaware of this. The set is very simple, bare boards but with white curtains on which to project the years and at each scene change the curtains are pulled round and re-opened on a figure of eight track to convey the passing of time with Alex Dankworth's music to pass the time. Roger Michell's direction is so subtly skilled as to be unobtrusive. I came away not convinced that this was a great work of literature but that I had seen three unparalleled performances. Highly recommended. For more about Harol Pinter and links to reviews of his works, including other Betrayal productions, see our Harold Pinter Backgrounder.